The Ascott Group, the hospitality arm of CapitaLand Ltd, may float its assets in Malaysia into Ascott Residence Trust (ART), a real estate investment trust (REIT) listed in Singapore. It currently owns and/or manages three serviced residences in Malaysia - Ascott Kuala Lumpur; Somerset Seri Bukit Ceylon, Kuala Lumpur; and Somerset Gateway, Kuching, Sarawak. 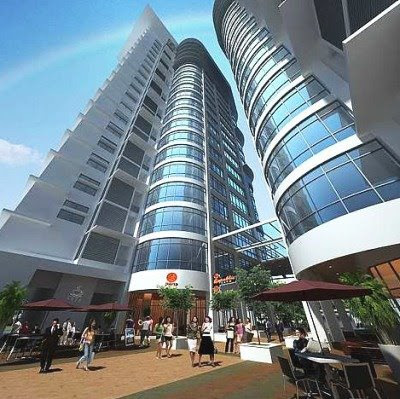 By end-2010, it will manage and own Somerset Ampang, which is being built for RM112.5 million. Under its corporate leasing division, it manages 68 apartment units in two properties - Seri Bukit Ceylon Residence, Kuala Lumpur and Marc Service Suites, Kuala Lumpur. It will manage 151 units of Tiffini by i-Zen in Mont' Kiara, Kuala Lumpur, developed by Ireka Group and due for completion by the first half of 2010. 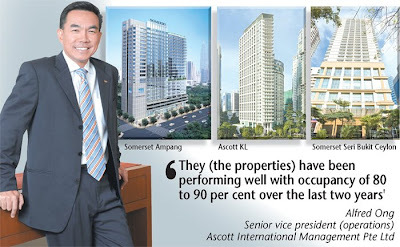 Ascott International Management (2001) Pte Ltd senior vice president (operations) Alfred Ong said it is experiencing strong and stable performance at the properties. "They have been performing well with occupancy of 80 to 90 per cent over the last two years and are suitable to be injected into the trust," Ong told Business Times in Singapore recently. Launched in 2006, ART has a combined portfolio of S$1.5 billion (RM3.6 billion) as at June 30, 2008, comprising 37 serviced residences and rental housing properties across seven countries. It is the first Pan-Asian serviced residence REIT set up to invest primarily in income-producing real estate like serviced residences and rental housing. Ong said the group is on constant look-out for more opportunities in Malaysia to grow its presence. "Our business in Malaysia is strong. Our occupancy and rates for our properties are above market, which gives us reasons to want to size up the locations and the properties," he said. Ong said the group, which has invested RM193.7 million in Malaysia since 1998, is keen to explore potential in Penang, in Johor's Iskandar Region and in Petaling Jaya, Selangor. "We are looking for more management contracts to manage residences for owners. We are negotiating for a few contracts in Kuala Lumpur and hope to seal a deal or two by the end of this year," he said. Ong said the group is also looking for equity participation, which may involve land acquisition. It will work with local joint ventures or farm out building projects, he added. The Ascott Group, the hospitality arm of CapitaLand Ltd, controlled by Singapore's Temasek Holdings, aims to manage more properties in Malaysia. It now manages 68 apartment units at Seri Bukit Ceylon Residence and Marc Service Suites in Kuala Lumpur. It will manage 151 units of Tiffani by i-Zen in Mont' Kiara, Kuala Lumpur, developed by Ireka Group, due for completion by the first half of 2010. "We have been invited by developers who want us to manage their properties under our existing brands and we are looking into it," Ascott International Management (2001) Pte Ltd (AIM) senior vice president (operations) Alfred Ong told Business Times. The Ascott Group, the largest global serviced residence operator in Asia-Pacific, Europe and the Gulf region, owns and manages 128 operational properties with 33 more coming up, under three brands - Ascott, Somerset and Citadines. In Malaysia, it owns and/or manages Ascott Kuala Lumpur; Somerset Seri Bukit Ceylon, Kuala Lumpur; Somerset Gateway, Kuching, Sarawak; and Somerset Ampang, Kuala Lumpur, which will open by end-2010. The brands Ascott and Somerset were introduced in Malaysia in 1998 and 2001 respectively, each aimed at high-end business travellers and expatriate families. Ong said it is exploring ways to bring in Citadines, a more trendy brand popular in Europe, targeted at young and independent travellers. In addition, Ong said, there may be "some improvement" in the group's net profit and revenue in its current financial year ending December 31, 2008, driven by higher portfolio gains. Last year, it achieved a net profit of S$177.3 million (RM427 million) and revenue of S$435.3 million (RM1.1 billion), up by eight per cent and seven per cent respectively over 2006. Ong said most of its properties offer an average 65 per cent gross operating profit, with some going as high as 80 per cent, he said. MALTON Bhd sees the potential to build up its exposure in the commercial and high-end residential property sector to weather the slowdown in the medium-end residential property market. “The challenging market conditions, fuelled by rising construction costs and petrol prices, have resulted in a slower take up of property. Developers with ongoing projects have to be ingenious to ride out the tough times,” director of sales and marketing Tracey Lai told StarBiz. Tracey Lai explaining the development plan for The Grove. She said while a slowdown has crept into the residential market, there was still room for more commercial projects, especially Grade A offices in Petaling Jaya. Being an integrated developer helps as Malton’s construction division undertakes most of the company’s construction needs. This act as a buffer against any need for cost renegotiations with contractors or stalling of projects. “Our target market is very niche and provide some form of cushion against any excessive margin erosion caused by the rising construction costs,” Lai said. She said in keeping to the company’s market-driven and buyer-centric product policies, its line up of projects would be targeting at the high-end market. Malton’s strategy is to focus on product differentiation and the right branding for a broad spectrum of upmarket lifestyle products, Lai added. “We believe high-end property products will continue to enjoy good take up as high net worth investors are quite insulated from the prevailing high food and fuel prices. Many are looking to invest in properties to hedge against rising inflation. “While there are still uncertainties in the market, we believe an equilibrium will be reached in due course and the market will become buoyant again,” Lai said. She said despite the prevailing caution among potential buyers, the property market would still be a good investment for investors, given the good rental yields and capital appreciation to be made. “Developments at popular and prime locations will continue to attract buyers as decent yields could be reaped. “Compared with many other countries in the region, Malaysia’s real estate products are still very much under priced and even with the full impact of cost increases, prices are relatively lower. High-end properties in the country are considerably more affordable compared with in other countries,” she added. Besides the quality workmanship and finishes, initiatives such as Malaysia My Second Home programme have also helped to attract foreigners to the country’s shores. Liberalising guidelines such as the exemption of real property gains tax and relaxation of foreign ownership restrictions have also fuelled foreign buyers’ confidence in the market. “There is still room to further raise the attractiveness of local real estate to foreign investors. This will largely depend on the Government’s efforts to ensure a healthy and stable economy and further liberalise foreign ownership guidelines. “In the current challenging times, there is a need to be market savvy and more buyer specific. We have to work a lot harder to connect with and reach out to the buyers that include South Koreans, Chinese, Middle Easterners and Russians,” Lai said. Malton has a number of interesting high-end residential and commercial projects that have a total gross development value (GDV) of RM2.1bil. An artist's impression of a waterscape Villa at The Grove @ SS23 to be developed by Malton in Petaling Jaya. One of its latest lifestyle offerings is the high-end gated development, The Grove in SS23, Petaling Jaya. 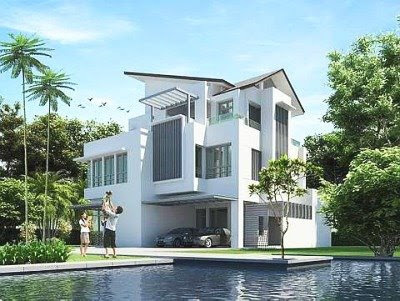 The project on a 4.8 acre freehold land comprises only 35 exclusive three-storey bungalows and link bungalows priced from RM3mil to RM3.8mil each. The Grove, with GDV of RM119mil, is planned for launch in October. The designer homes, with six plus one en-suite bedrooms with a feature lift, boasts of a tropical garden living experience complete with water features. The other upmarket residential projects include The Pearl @ KLCC and Amaya Saujana @ Saujana Subang. The Pearl @ KLCC comprises a high-end condominium project along Jalan Stonor and within the KLCC enclave. The 41-storey block of 177 luxurious condominiums are spacious residences from 3,000 to 20,000 sq ft, including seven duplexes and three penthouses. The 13-storey residential suite block of Amaya Saujana offers 318 residences priced from RM605,000 to RM918,000. An artist's impression of the V-Square commercial project. Malton’s flagship commercial development is V-Square (VSQ) – an integrated commercial project comprising two blocks of corporate tower, a block of corporate business suites, and two blocks of corporate offices, with retail space on the ground floors. The project on a 2.6-acre plot in Jalan Utara, Petaling Jaya, will have a GDV of RM207mil. RESORT STYLE LIVING: Hamidon (right) and Yam engrossed in a discussion on the Serai Saujana project. SERAI Saujana Development (Serai) Sdn Bhd is working on a luxury boutique project in Subang, Selangor, which it may replicate in Kuala Lumpur and Langkawi in two years. It is developing its flagship Serai Saujana, a luxury RM320 million gated and guarded community on a 4.25ha site within the Saujana enclave. Serai Saujana comprises two 15-storey blocks of condominium with 163 units dubbed The View, priced from RM500 per sq ft and 42 units of three-storey homes known as The Villa, averaging at RM850 per sq ft.
Chairman and controlling stakeholder Hamidon Abdullah said 65 per cent of the units have been snapped up in the last eight months even before the launch. "It is true that we are profit-driven, but we believe in our product and will market it to sustain in time. We do not intend to accelerate on the sales. Our philosophy is to deliver first," he told Business Times during a preview of the show unit recently. Hamidon said the project, which elevates the art of resort living into an exquisite masterpiece backed by style, substance and serenity, has attracted locals and buyers from Korea, the UK, Australia, Sweden and the Middle East. The other stakeholders of Serai are Saujana Consolidated Bhd with 30 per cent interest and Sunrise Bhd's former managing director Datuk Michael Yam and his brother with 20 per cent share. Hamidon is confident that Serai Saujana will sell due to its exclusive location, which is adjacent to The Saujana Kuala Lumpur, Saujana Golf and Country Club and two 18-hole golf courses. The development at the last piece of prime residential freehold site started early this year and is due for completion by mid-2010. The View, which come in six designs and layouts, has built-up sizes ranging from 1,817 to 3,271 sq ft while the duplex penthouses range from 4,526 to 6,108 sq ft. The Villas, with resort style living, offer built-ups ranging from 5,200 sq ft to 6,000 sq ft boasting four spectacular designs - stand alone, linked, corner or intermediate units, each with a private elevator, pool and gazebo area. As for expanding the "Serai Saujana" brand, Hamidon said future projects, which it is in no hurry to launch now, will improve in terms of design, functional space and creation of the environment. "We want to deliver what we are saying we will deliver first. So the plan now is to focus on the existing development," Hamidon said. PANGKOR Island Beach Resort expects occupancy and growth in room rates to be flat this year and 2009, as promotional activities and access into the island remain the same. The four-star resort, owned and operated by IGB Corp Bhd, achieved a 65 per cent occupancy and an average room rate (ARR) of RM210 last year. "For 2008 and 2009, we expect occupancy to remain at 65 per cent. We should finish this year at an ARR of RM230 and 2009 by about 20 per cent more," general manager Jimmy S. H. Yeo said. Although a 20 per cent increase in ARR translates to RM276 per night, Yeo said this is to mostly account for the increased cost of operation. Yeo said if the hotel raises rates to help increase revenue, tourists will simply opt for other destinations. "People are very conscious and sensitive about costs and they have options. Low-cost carriers offer attractive fares to other regional destinations," he said. The option of filling more rooms to improve revenue is also proving to be tough. Yeo said that the number of Taiwanese guests, making a major component at the resort, is reduced by 40 per cent this year compared to last year as they chose to travel to different locations. "As a result, the hotel is now working on introducing various packages to improve its performance," he said in Pangkor recently. One such package recently introduced is the Fly & Stay Free at Pangkor Island Beach Resort. Flights on the 48-seater Dash 7 air-craft into Pangkor, managed by Berjaya Air, are five times a week except on Tuesdays and Thurs-days. For example, a return air journey for two persons for a one-night stay is RM1,252 (RM496 per person for flight and RM260 per night based on best online rate) and RM856 nett for one-night twin sharing, including breakfast and free usage of non-motorised land and sea sports. The package is valid until December 19. Meanwhile, Yeo, who is also the chairman of MAH (Malaysian Association of Hotel) Chapter in Perak, plans to present a memoran-dum to the authorities to consider helping to improve Pangkor Island, especially in terms of accessibility. "If the island had a bigger runway to accommodate bigger planes, it will definitely help tourist arrivals into Pangkor," he said. In fact, the hotel sits on a 40.5ha site, of which less than half has been developed. Yeo said that further development in Pangkor by IGB or other investors is unlikely to take place until and unless access into the island improves. The 258-room hotel, which opened in 1986, was first managed by Pan Pacific. In 2004, IGB decided that its hotel management subsidiary Cititel Hotel Management will run the resort. TRADEWINDS Corp Bhd, a company controlled by businessman Tan Sri Syed Mokhtar Al-Bukhary, has scrapped plans to halve room inventory and build luxury residences at its hotel in Penang. The Mutiara Beach Resort Penang, which will be rebranded as InterContinental Resort Penang, has been closed for the past 29 months to accommodate a major renovation exercise. Chairman Tan Sri Megat Najmuddin Megat Khas said that the decision to only have hotel rooms was made recently following a discussion with Syed Mokhtar. "Tradewinds will now retain the hotel rooms and not have any serviced residences as the cost of building the product will not commensurate with the returns on investment," Megat Najmuddin told Business Times. Tradewinds had planned to reduce the inventory of the 438-room property to 220 rooms and include 80 units of luxury residences. Cost at the time was estimated at around RM100 milion. The residences were earmarked to be sold at around RM500 per sq ft and leased back. Officials of the company had then expected the hotel to reopen at the end of 2008. However, due to longer-than-anticipated delay in obtaining planning approvals and rising cost of materials, these plans have been abandoned. Accordingly, the hotel will now only need some structural work and interior design work. Work on this is expected to begin by year-end and be ready for operation in mid-2009. A sum of RM100 million is expected to be spent on the hotel, given the increase in cost and to convert the property to a luxury standard. Megat Najmuddin said that Tradewinds was also working on obtaining financing for the project. On whether the closure of the hotel for over two years is having an impact on group business, he said the hotel was previously only marginally profitable. Tradewinds Corp's hotel portfolio includes Crowne Plaza Mutiara Kuala Lumpur, Hotel Istana, Hilton Petaling Jaya and Mutiara Johor Baru. In the six months ended June 30 2008, the hotel division raked in RM159.07 million in revenue, or 70 per cent of the group's revenue of RM227.49 million. IJM Land Bhd will rebrand itself this Thursday as a new corporate entity that aims to be a top tier local developer with geographically diversified projects in Malaysia. The rebranding exercise comes as IJM Land has completed its rationalisation of IJM Properties into the former last Friday. "With a streamlined and focused business now, we can call ourselves a property supermarket as we have high-end products in KLCC and low-cost products in other townships," IJM Land managing director Datuk Soam Heng Choon told Business Times in an interview. IJM Land currently sits on an enlarged landbank of 4,253ha with a gross development value (GDV) of RM26 billion, after holding company IJM Corp Bhd combined property units RB Land Holdings Bhd and IJM Properties Sdn Bhd into one entity. As a softening property market looms ahead, Soam said, IJM Land will focus on its positive markets such as Sandakan and Penang. "In Sandakan, the market is still bullish as its driven by crude palm oil while in Penang, we are launching new projects like The Light which will propel us into bigger developments there," he said. The Light development is divided into four phases including residential, commercial and mixed developments plus seafront facilities. The first residential phase, the Light Linear and Light Point projects, will be launched by year-end. "This project will see a blend of the new and old Penang," said Soam. For a challenging market like Johor Baru, Soam said, the company will work harder at selling units while tweaking its products to meet the current market needs. "We will focus on the medium to medium high-end markets and slow down on (developing new) mass housing projects under RM250,000," he added. Soam said, to contend with rising material costs and a softening property market, IJM Land will target housing needs of specific market segments. "We are focusing on the Malaysia My Second Home programme and marketing our Penang Pearl Regency project overseas. We are doing a sales launch overseas targeting Koreans over the next two months and if the response is encouraging, we will then do this for our other products," he said. On overseas development, its maiden project will be an upmarket residential and retail project in China's automotive city, Changchun, with a GDV of RM500 million. "We are looking at other second tier cities in China while considering other emerging markets such as Vietnam. However, we have not set a timeframe," Soam said. KULIM (M) Bhd will be looking at plantation REITs (real estate investment trusts) and a separate listing for its plantation unit as part of its effort to unlock the value of the group’s diversified portfolio. Managing director Ahamad Mohamad said the two avenues were among those closely considered under the group’s expansion plan but so far, no time frame has been set. “Kulim is looking at various proposals to unlock its value and further enhance shareholders’ worth. “Nevertheless, the current pessimism surrounding the global equity market warrants a very cautious approach,” he told StarBiz. Kulim is involved in four strategic core businesses – oil palm plantations, oleochemicals, biodiesel and quick-service restaurants. Ahamad said the group planned to increase its landbank in Malaysia and Papua New Guinea (PNG) to ensure expansion in its plantation operations. “Our strong financial position allows us to explore acquisition opportunities, especially in PNG, but we are doing it cautiously due to the buoyancy and prevailing high prices,” he added. The group is also committed to the Roundtable on Sustainable Palm Oil (RSPO) principles as “we are cautious in opening new areas that will be regarded as unsustainable”. He said Kulim was also open to landbank offers in Malaysia although such opportunities were quite limited. As at March 2008, the group has 31,422ha in Malaysia, 44,714ha in PNG and 6,594ha in the Solomon Islands. According to Ahamad, PNG would feature prominently in the plantation division’s future expansion. Its PNG subsidiary New Britain Palm Oil Ltd (NBPOL) is in the midst of acquiring Ramu Agri Industries Ltd (Ramu), which is listed on the Port Moresby Stock Exchange. Ongoing expansion into new areas adjacent to the group’s existing operation is also taking place at 2,000ha to 4,000ha per year. NBPOL is also setting up an integrated palm oil refinery in Britain with a production capacity of about 200,000 tonnes per year. It is slated to be commissioned by end of first quarter 2010. “The move will see NBPOL expanding into the European Union and will make it one of the first palm oil producers to offer fully traceable and sustainable palm oil product,” Ahamad added. On the group’s biodiesel operations, he said the lower palm oil price, which trades competitively with the crude oil price, does provide support for the viability of Kulim’s biodiesel production. Kulim has a joint-venture with German-based Peter Cremer (S) GmbH to set up two biodiesel plants – one in Johor and another in Singapore. “We are still cautious on the commencement and operational arrangement of our Tanjung Langsat plant as there are other factors to account for,” he added. However, the group’s biodiesel plant in Jurong, Singapore, which has been in operation since early this year, has been profitable. This is mainly due to the favourable tax and duty structures. “We believe that the long-term viability of the biodiesel business rests heavily on legislation or government mandate,” added Ahamad. As for the foods and restaurants division, QSR Brands Bhd (QSR) and KFC Holdings (M) Bhd (KFCH) have taken measures since early 2008 to stay ahead of competition while the market re-adjusts its spending as a result of the higher cost of living. He pointed out the the success in securing franchise rights for Pizza Hut and KFC in Cambodia from principle Yum! Restaurants Asia Pte Ltd could see QSR emerging as a dominant force in the country’s food and beverage industry. “We have introduced two KFC restaurants in Phnom Penh. We plan to open three more KFC outlets in that country in 2008 with an estimated investment of US$3mil,” he said. This complements the existing plans of QSR to open more Pizza Hut and KFC outlets in Malaysia and neighbouring countries in 2008.